Fore Golfers Network launched in early 2017 as a sister channel to the longstanding Michigan Golf Live Radio/TV program. Produced and hosted by veteran broadcaster, Bill Hobson, these two complementary golf outlets celebrate the game via a wide array of messaging vehicles ranging from traditional (TV and Radio) to cutting edge (weekly Podcasts, YouTube channels, social media interaction). NEW FOR 2019: FGN TV makes its debut across the Midwest! 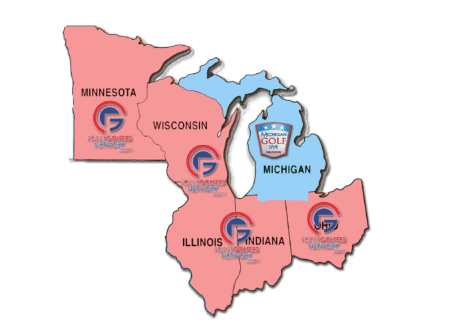 With TV affiliates in Chicago, Minneapolis, Columbus, Milwaukee, and dozens of important markets, FGN TV is now ready to take YOUR message to golf fans throughout the region! Our flagship programs – MGL TV – continues to blanket our home state, but now FGN TV broadens our reach into literally MILLIONS of additional homes! It’s time for YOU to partner with FGN, to use our key outlets and affiliates to reach YOUR customers. We are proud to be the leading golf voice in the region and look forward to helping share YOUR story! Our pledge to you is to get creative, deliver impact, and generate business by encouraging our audience to play, stay, and purchase from our partners.